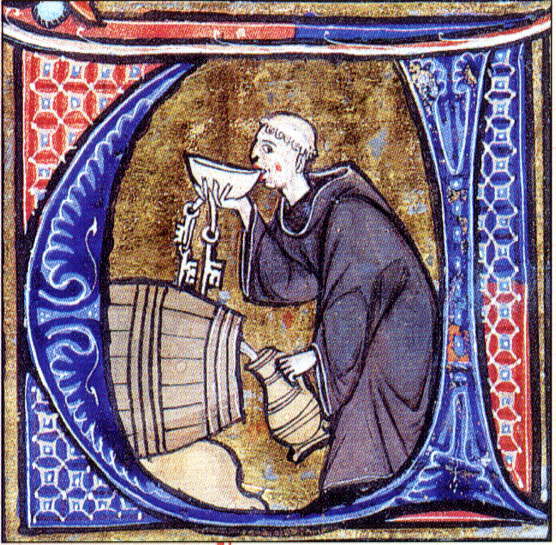 A recently published study reveals that obesity may have been more common for medieval monks. The ‘Obese Medieval Monk’: A multidisciplinary study of a stereotype, by Pip Patrick, has been published this year by Archaeopress as part of their British Archaeological Reports (BAR) series. The main focus of this book is an analysis of the skeletal remains of monks from three monasteries in what is now modern-day Greater London: St. Mary Graces Abbey in Tower Hill, St. Saviour’s Abbey in Bermondsey and St. Mary’s Priory in Merton. From these three sites, 274 skeletons were examined and compared with ‘secular’ medieval skeletons from this region. Patrick also looked at the diet and eating habits of monks in medieval England, and noted that protein and saturated fats were the mainstays of the monastic diet. More importantly, the schedule of how monks ate – with two meals a day in the summer months, and just one large meal during the winter, all of which had to be eaten in a strict and short amount of time – would have likely lead to the monks gorging on food and having a less efficient digestive system. Patrick concludes that “the lifestyle of the monks at Merton, Bermondsey and St. Mary Graces seem to have provided the right conditions for individuals genetically predisposed to obesity and its related diseases to manifest those conditions.” She cautions that this was a small study that only used sites in one geographical area, and urges further research in other medieval monasteries. Pip Patrick is a Senior Trials Coordinator for the Cancer Research UK and UCL Cancer Trials Centre. She has authored various studies related to osteoarchaeology and human health, for both the medieval and modern periods. For more information about The ‘Obese Medieval Monk’: A multidisciplinary study of a stereotype, please visit the Archaeopress website.